The fact that Reid has not been able to pass his own version and he is blocking a bill that moves toward the less intrusive government the people want is indicative of the total disregard the Nevada Senator has for the will and wisdom of the populace. As a dedicated progressive elitist, Reid is a political soul mate to the presidential pretender. 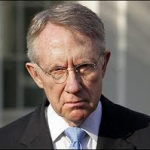 Before Barack Hussein Obama rose to power, we didn’t hear too much of Harry Reid. After listening to him speak for just a few minutes one understands why he never won the title of Mr. Charisma. This means he has ways, other than a dazzling personality, of enforcing party discipline. With some, I am sure, the true believers in the movement, he has no difficulty at all. With others… I’d rather not think about his methods. This man, like his president, stands against the will of the people to stop the spending, just as he stood against the desires of the citizens as he shepherded the dreaded ObamaCare through the Senate. Obama, Pelosi and Reid, along with their legislative cohorts, have continuously thumbed their noses at the American people, yet not to the extent they have since in the past few years. It may be they just lacked the opportunity to exhibit these qualities. It may be that there was a time when they were really nice, reasonable people, but something happened to them. Or… it may be that Obama’s excessively confident and arrogant narcissism has infected much of the congress and federal bureaucracies, and oozed down to parts of the general population. It seems that the atmosphere has changed, not only in Washington, but throughout the nation. It hits us on two fronts. Those who follow the Obamessiah have been energized and their attitude has poisoned many relationships. Then there are those of us who see the error of his ways. We have to put up with this obnoxious behavior of the people around us and those who govern us. Some of our relationships have been destroyed. Some of our relationships have been retained, but deformed in some way. Most of us are pretty nice people and we usually tolerate many insults and inconveniences. Most of us would rather put up with annoying people or minor intrusions than create a scene or stand up against something we know to be wrong… especially if there is some kind of cost or effort required on our part. However, the arrogance and injury we have experienced at the hands of these beltway bandits have awakened many of us. Proverbs 19:11tells us “A man’s wisdom gives him patience; it is to his glory to overlook an offense.” (NIV) This is very true, yet when the damage is done to others – our duty to look out for our brothers and be there keeper kicks in. This is why we have to stand up for right and oppose what is wrong. For those who believe Christians need to stay clear of the dirty sport of politics, I would suggest remembering IT’S NOT ABOUT YOU! And, it’s not about me. It’s about being the salt and light in a dark and depraved world. It’s about exhibiting the values and behavior we know make life work it a world where nothing seems to work anymore. We cannot allow ourselves the luxury of the self absorbed egocentricity. Those of us who are Christians see the world around us and need to “work out our salvation with fear and trembling”. One of the heroes of the faith, Deitrich Bonhoeffer summed it up when he said, “Silence in the face of evil is itself evil: God will not hold us guiltless. Not to speak is to speak. Not to act is to act.” We are faced with an increasingly detached, brutal and uncaring government. We can tolerate some of this ourselves, but we cannot forget about those around us, and who should come after us, who are suffering.